I guess it was at least 25 years ago that a friend gave me Sweet Woodruff. Herbs and dried flowers were her passion and she propagated and raised them for market. She also dried them for market and the great room in her home was filled with dried herb bouquets hanging from the rafters. In addition, there were hundreds of beautiful straw flowers with wire stems held in porous blocks. Hilda taught me just about everything I know about herbs and that training has added so much to my gardens and my life. Since our area has its roots in colonial times, many people who grow herbs here plant formal herb gardens. That has never been my choice, as I prefer to mix the herbs among other perennials and plants. I remember Hilda’s gift of Sweet Woodruff and even where she suggested I plant it. It never did especially well for me, but I managed to keep it going although sparsely. When we first moved here, the area in our back yard that we now refer to as the tree bed had 4 large trees, hundreds of old crushed crab pots, old engine blocks, a iron fence, lots of other trashand what seemed like tons of poison growing everywhere including up the trees. Bill filled and hauled trailer after trailer of trash. Since he could only tackle this project a little each week, it took a while for him to get the area clean. 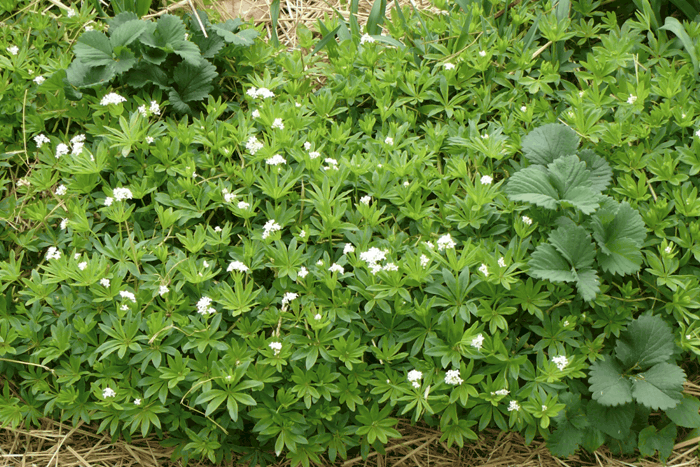 This was the spot (pictured below) I had in mind for my Sweet Woodruff and I was hoping it would fill the entire bed. I gave it 3 years and could see it was not going to be any more prolific than at our prior garden. Most of what I planted remains, and has blended with the other ground cover. 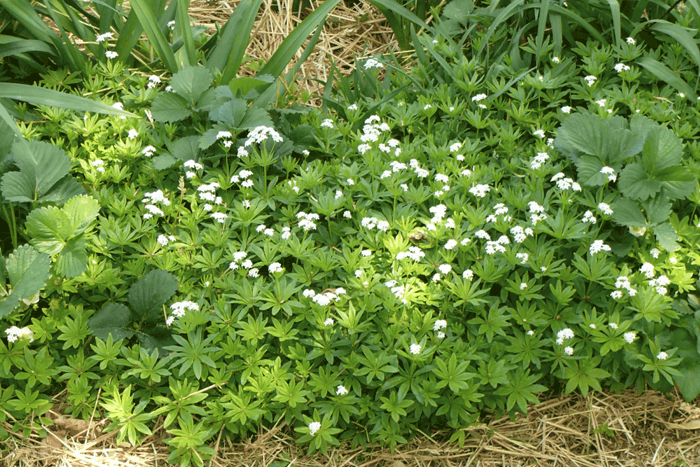 I transplanted Sweet Woodruff to a border in front of the garden very close to the tree bed. It has almost the same amount of shade. After all those years it finally found a spot it loves. I’ve also read accounts that refer to sweet woodruff as a noxious, invasive weed growing more vigorously with regular watering. Mine has had years that were especially dry and years of more rain than usual but still it remains contained. In times gone by it was used to treat wounds and for culinary purposes as well. I think they use to put it in wines. It’s suppose to be a natural insect repellent and is recommended for use (when dried) under carpets, in pet bedding and in linen closets. I wonder if it would keep moths away from wool jackets in closets? I think I’ll try it this year. 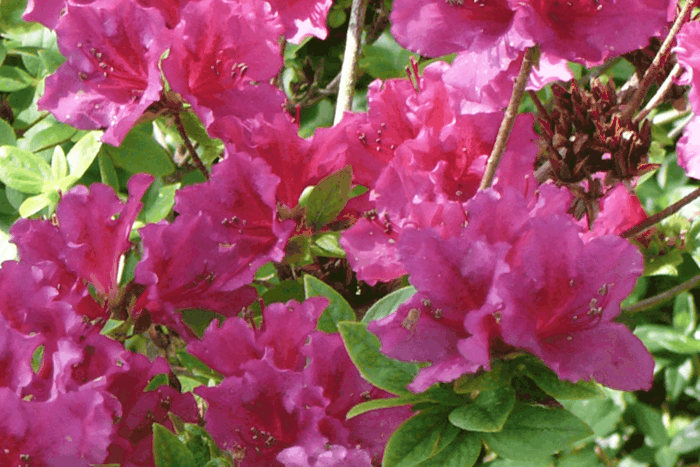 I just had to show you the azalea that is starting to bloom in the tree bed. The color is so vibrant. Enjoyed you info very much. I’m looking for something to grow under shady pine trees w/acidic soil. Also read the strawberries do well there. I think I could have both side by side I think?